The spooler function is saving print data and conducting background printing. Even in systems where multiple print jobs are concentrated, an application system can be configured so that response is not impeded. General printing applications finish transactions upon confirming the printing. Due to such waiting, response times deteriorate in systems where multiple print jobs are concentrated. The spooler application stores print data and immediately returns the printing results to the application. This allows the application to proceed to the next operation without waiting for the current printing job to be completed. Devices A to C request printing of data A to C almost simultaneously. 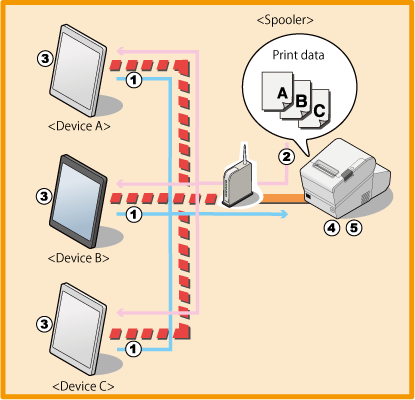 The spooler function saves the print data in the spooler in the order it receives it, and returns the printing results to each device. Each device application completes the printing process and executes the next operation. This product successively prints print data A to C.
The spooler function saves the printing results in the log. The print forwarding function is enables printing to be performed from a different printer if it cannot be performed on a certain one. You can configure a secure system that enables printing to be performed on a separate printer even if one printer cannot be used. All you need to do is specify the forwarded printer in the case where printing cannot be performed to EPSON TMNet WebConfig. There is no need to resend print data. Complicated processing is required in order to implement a function by a general application for printing from a separate printer when a printer cannot be printed. By using print forwarding, since Print Forwarding function automatically conducts forward printing, the printing process on the customer's application can be simplified. 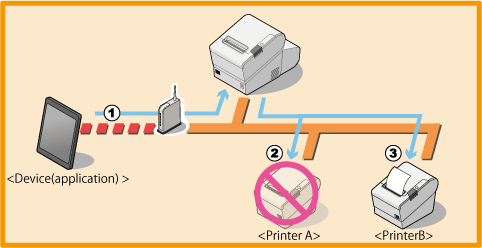 The device application sends the print data to printer A. In reality, TM-Intelligent printer tries to conduct printing process on printer A. But printer A cannot print because it is offline. TM-Intelligent printer retries the number of times that is set in the spooler function. TM-Intelligent printer prints with printer B.